Alison Wells: My four children are between 10 and 3 years old. As a novelist and short story writer, I was interested to find out how other women writers with young children manage their writing time and find creativity among chaos. In this series of interviews we hear from writers from Ireland, England, France, the US, and Australia who are at various stages in their writing careers. Maria Duffy (pictured with her family at right) from Dublin, Ireland is a mum (or mammy!) 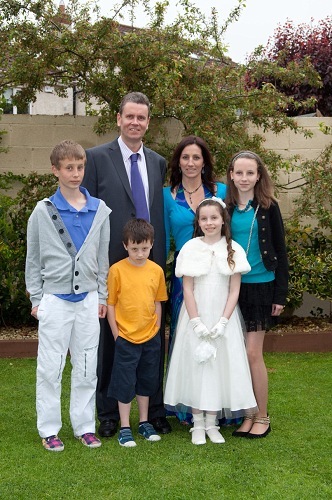 of four children: Eoin, 14, Roisin, 13, Enya, 9 and Conor, 7. She writes women’s fiction and recently signed with Curtis Brown agent Sheila Crowley. She has had stories published — in A Pint And A Haircut and in a US anthology called Saying Goodbye and she blogs fabulously for Hellomagazine.com, interviewing celebrity tweeters. When did you start writing, Maria? Had you established a writing rhythm or career before or did it happen alongside the kids? I’ve always been interested in writing but never did much about it. I was always the one to write the silly poem when somebody was leaving their job or celebrating a big birthday. I suppose I always wrote bits and pieces but never really had the confidence or belief in myself to take it any further. When the children were very young (I had four under six), I began to write a novel. It was a revelation to me because I fell in love with the art of bringing the characters to life on the page and exploring their lives. As the children got older, I began to write more and now couldn’t imagine doing anything else with my life. I would probably say it’s had a good impact. Before I had children, I had a fulltime job in the bank and worked long hours. When I had my third child, I gave up my job to stay at home with the children. It was really only then that I began to explore the idea of writing more seriously. If I’d stayed at the bank, I probably would have always written but not to the extent I do now. I have a pretty good routine these days. It was certainly more difficult when the children were younger and I always had at least one of them at home with me. Now that they’re all in school, I drop them off at 9:15 am and the day is mine until I collect them at 3 pm. Although I write from home, I discipline myself to look on it like any other job and force myself to ignore the piles of ironing and the layers of dust on the furniture! I used to find this difficult and I’d often lose a whole day of writing because I’d decide my house was filthy and I just had to clean it! These days I tell myself that if I was out of the house working at another job, the housework wouldn’t be done so I close my eyes, step over the pile of washing and go and write! The other thing I’ve learned to do is to say no to offers from friends to go for coffee or shopping. I have a number of friends who have young children and we used to spend long mornings putting the world to rights over coffee. Now I just tell them I’m working and either catch up with them in the evenings or weekends. I think it’s often difficult to get the balance right. In theory, I write while the children are in school and spend the rest of the day doing homework with them, bringing them to their after-school activities, making dinner, etc. But that’s the ideal scenario. As any writer would tell you, deadlines loom and pressure builds and sometimes the writing day can spill over into the evening or night. Sometimes I might be having a productive day and the words are flowing. On those days, it’s very difficult to just stop at a certain time and not do any more. Also, life is so unpredictable when you have children. It only takes one of them to have a tummy bug or a bout of tonsillitis for all my best-laid plans to go out the window. And don’t talk to me about mid-term…! You’ve made breakthroughs, such as becoming a blogger for Hello Magazine and securing agent representation at Curtis Brown. When did your proudest writing moments happen and how did you feel? I think these days both women and men face challenges in career/family life. I’ve already mentioned the challenges I face as a mother but in my situation, my husband faces those challenges too. He’s very supportive of me and my writing and he’ll muck in as much as he can to help. He works fulltime but has set up an office for himself at home in order to try to work at least one day a week from home. He does this so that he can help with the children/housework etc. and allow me to write. At times when I’m under pressure, he tells me to just keep my head down and write and he’s the one who ends up juggling work and children. I’m very lucky to have him. Something has to give when wearing many hats. What is it for you? Oh that’s an easy one — the ironing, the cleaning, the making of healthy dinners…! Put it this way, if I have an hour to spare, I’d rather sit and chat with the children and find out about their day rather than spend it doing housework! The other thing you can do to free up more time is think ahead about dinners for the week. I often make a few dinners at weekends and freeze them –things like casseroles or stews that can be defrosted and heated up easily. I also make sure there are plenty of snacks in the house so the children won’t go hungry while I have my head in the computer! Thanks so much for your fabulous answers Maria! Wishing you every success for publication of your novel! Find out more about Maria on her blog Writenowmom. See Maria in action interviewing the stars on Hellomagazine.com on her Stars in the Twitterverse blog. I loved reading this and the advice was WONDERFUL. If I really want to do it, I WILL FIND A WAY TO IT – isn’t that so true for any area of our lives?